Just a little note card using one of many of my favorite Penny Black Stamps. I think everyone that I own is a favorite! :) I colored with copics and the paper is from DCWV. 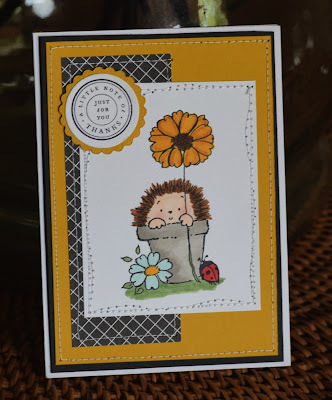 A gorgeous creation with the cute PB image Stephanie, many thanks for sharing with us at Penny Black and More challenge. aw, what a cutie! it is hard to pick a favourite; they're all adorable. thank you so much for playing along with us at the penny black and more challenge. Love your choice of colours and your fab layout, how can we have a Penny Black favourite when there all so gorgeous, thank you for sharing your gorgeous card with us at PBSC and hope you will pop in next time.